Under the news radar but in this show: the wild situation in a hot Arctic. The Director of the National Snow and Ice Data Center Mark Serreze gives us the latest science. Climate information activist Jennifer Hynes explains the Arctic methane monster. Scientist Paul Beckwith reports on Hansen’s mega-storms. They are already here, throwing hundred ton boulders up on the shore. Three guests: let’s go. With a rising sense of panic about rapid warming in the Arctic, even during this past Polar winter, it’s time to check in with an expert in the field, Dr. Mark Serreze. 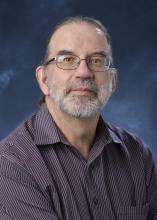 He is the Director of the National Snow & Ice Data Center, and Professor of Geography at the University of Colorado, Boulder. 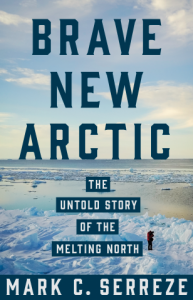 Mark has a new book coming out in April about the development of Arctic science. It’s been a while. Back in 2012, Mark talked about the “Arctic Death Spiral” on Radio Ecoshock . Is it accurate to say Arctic Sea ice is declining at a rate of 13.3% per decade? Is the total volume of Arctic sea ice also declining? Was the North Pole above freezing in February, and is that unusual? Why did the Polar Vortex split this winter, spilling cold air into Europe and over my home in the Pacific Northwest? Mark Serreze published research with Alex Crawford in 2017 on cyclones in Polar regions. If we continue on our current strong emissions path, there will be more or stronger storms in the Arctic in coming decades. That changes the dynamics of sea ice. So it isn’t just the added heat in the Arctic. There are many factors at play reducing the amount of ice cover in the Arctic. “Projected Changes in the Arctic Frontal Zone and Summer Arctic Cyclone Activity in the CESM Large Ensemble” by Alex D. Crawford and Mark C. Serreze. There is brand new science out on the behavior of water pools appearing and disappearing on Greenland. That is the paper by Poul Christoffersen et al. [‘Cascading lake drainage on the Greenland Ice Sheet triggered by tensile shock and fracture.’], It was just published in Nature Communications. Mark talks to us about Greenland in the Arctic puzzle. 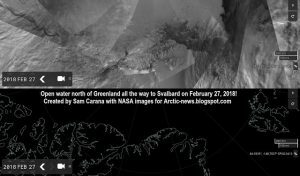 There is also concern about sea ice normally thick and strong north of Greenland has given way to open sea water in February 2018. Image courtesy of Sam Carana of the Arctic News blog. We know a large pool of colder meltwater has formed in the Atlantic south of Greenland. It’s one of the few blue spots on global heat maps, one of the few places getting colder in a warming world. Some scientists suggest that pool of ocean cooling could alter the weather in the UK and Northern Europe. Meltwater in the oceans could throw us some unpleasant surprises. I’m getting emails from listeners, including a few scientists, who feel a sense of panic about what is happening in the Arctic. They also see national news organizations are not covering Arctic changes and what they really mean. How do we get past the starving polar bears phenomenon, to realize a rapidly changing Arctic definitely includes us? Next month you can look for Mark’s new book “Brave New Arctic: The Untold Story of the Melting North”. Many people learned about the Arctic methane threat through viral videos produced by Jennifer Hynes. She is a professional IT specialist, familiar with assembling large data, and a spiritually aware person. 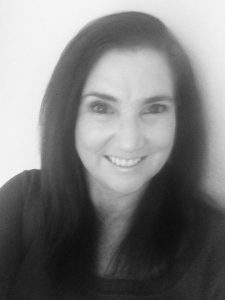 From Colorado, we welcome Jennifer Hynes to Radio Ecoshock. Three years ago Jennifer posted a You tube video “The Arctic Methane Monster’s Rapid Rise”. Over 50,000 people have watched it so far, and more than 40,000 for her update Part II, posted in September 2015. Jennifer is not a scientist. I call her “a climate information activist”. Jennifer is plugged into a group of scientists and activists who feel more panic about the Arctic than the public does. My understanding involves three possible sources for a massive methane release. The first is a fast burst, say 50 gigatons of methane escaping up through the sea and into the atmosphere. That possibility was suggested by Alaska-based scientist Natalia Shakhova, and Russian scientist Igor Semiletov. So far, that methane mega-burst has not happened, but it could at any time. The second methane monster arrives more slowly but more massively, and almost without end. That is organic material spread all across the Arctic lands, which thaws as the permafrost thaws, and rises through multitudes of lakes and bogs as methane. The third source again relates to research done by Shakhova, Semiletov, and others. It is the famous clathrate gun: methane frozen on shallow sea beds, and exposed by retreating sea ice, thaws in such volume that it clouds into the atmosphere. Some say the clathrate gun has not fired yet. Other say it has. Keeping up with Jennifer Hynes, it seems like her Facebook page is your best bet (other than You tube). But then everyone, including me, is reconsidering using Facebook. It turns out Facebook has been up to anti-democratic activities. We await to see big changes, or a different platform emerging. Connecting the Dots: from Methane to NTHE. Oh, and here is a new article by our popular guest, Australian scientist Andrew Glikson, on the Arctic methane threat. In his seminal book “Storms of Our Grandchildren” former NASA head scientist James Hansen predicted mega storms will sweep the Earth as climate change develops. When Hurricane Sandy flooded Manhattan and wrecked the New Jersey Shore in late 2014, I produced the program “Storms of Right Now”. After devastating hurricanes like Maria, New Englanders battered by three Nor’easters in the last two weeks must be wondering, are we entering a more unstable world, with bigger storms? Our regular science correspondent Paul Beckwith just posted a four-part You tube video series with new science on just that question. Paul tells us about super-waves as high as 100 feet (30 meters). Scientists in on the north shore of Ireland have carefully mapped out large stones along the coast. In the winter of 2013/14, several stones weighing 100 tons were moved by the waves. One of 640 tons was moved. The scientists documented it all. Similar studies have found storms were much stronger than expected on the coast of northern France (Brittany), and even in Italy along the Mediterranean. Paul and I discuss why mega-storms are becoming more common, years or even decades before they were expected. Just think of the billion and billions of dollar spent trying to rebuild after Hurricanes Harvey and Irma! After Hurricane Maria, there are still a million people in Puerto Rico without power. My worry is: if we get more, and more powerful storms, there comes a point where we are tired and broke. We can’t raise the money or the workforce to rebuild. Then what happens? Everyone can keep up their climate science education for free – by watching the You tube videos posted by our guest, Canadian climate scientist Paul Beckwith. You can go to this You tube channel or just type Paul’s name in the search box. Or get the latest at his web site, paulbeckwith.net Be sure to support Paul as he teaches climate science to the world via the Internet. 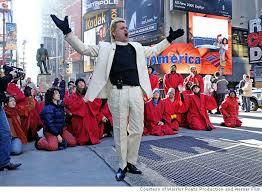 IF SHOPPING IS A RELIGION, WE NEED THE CHURCH OF STOP SHOPPING! Here is a Wiki about Billy and the Church, and here’s a link about his film “What Would Jesus Buy?”. We are out of time. Thank you for listening, and caring about our world. If you can, please help me spread this program even further. Radio Ecoshock is fundraising to reach out to more radio stations. We’ve already begun the work, but I need the help of a skilled contractor (because I already spend 40 hours a week making and distributing this show…) A donation of any amount would be welcome at this time. ← If It’s Warming – Why This Awful Winter?